Flare Top Trash Receptacle, built with reliability in mind. This tough, fully-welded commercial grade steel receptacle is a one-piece design with vertical slats and two horizontal bands at the neck and base that show off its simple clean lines. This imported 40 gallon flared top trash receptacle offers a flat lid with a pitch-in opening that conceals waste, minimize odors and encourages proper litter disposal. Never worry about losing the lid, there is a discrete security cable that is attached under the lid and then to the inside of the base. Included is a removable, steel liner, contoured to precisely fit the unit ensuring no unsightly gaps. 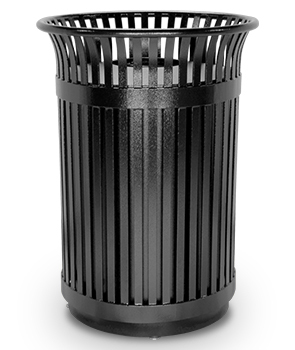 The all steel trash receptacle and liner are both thoroughly coated with a durable black powder-coat finish to protect against the effects of environmental conditions. This finish will inhibit rust and corrosion, promising many years of exceptional service. Stainless steel surface mount hardware included.